August 17, 2017 saw a major breakthrough in astronomy, when gravitational waves from a pair of colliding neutron stars were detected for the first time by the US-based Laser Interferometer Gravitational-Wave Observatory (LIGO) and the Europe-based Virgo detector. 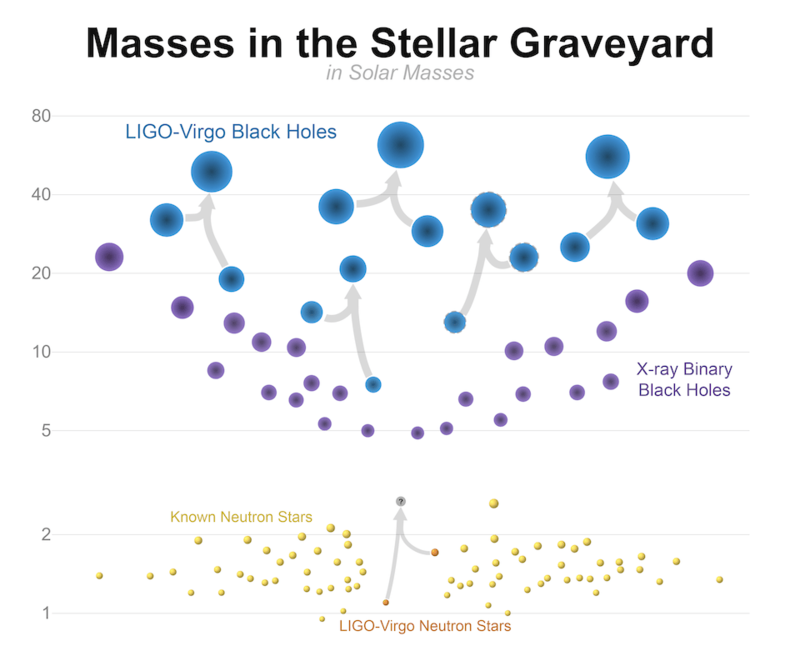 The detection was confirmed by a large number of telescopes around the world that studied various forms of radiation from the merger, marking the beginning of gravitational wave multi-messenger astronomy. This movie shows the LIGO and VIRGO observations of the gravitational wave GW170817. In the LIGO Hanford and LIGO Livingston panels, GW170817 appears as a blue-green/yellow curve. This "chirp" signal turns sharply upward near time 0 seconds, which is 5:41:04AM PDT on August 17, 2017. The movie converts a combination of the observed stretching and squeezing of the LIGO Hanford and LIGO Livingston detectors into sound at the same frequencies. Credit: LIGO/Virgo/Lovelace, Brown, Macleod, McIver, Nitz. Comparison of GW170817 signal to binary black hole merger signal detected before it. All waveforms are the inferred signals incident on the Hanford detector, and are shown from 30 Hz to merger. Signal from the neutron star merger was expectedly much longer than the black hole merger signals, though the total energy emitted by black hole mergers is much more compared to neutron star mergers. The short clip shows the merger of two neutron stars with 1.34 and 1.25 solar masses. The blue material is the matter which becomes unbound and leaves the system. The most likely scenario is that ejected matter from neutron star mergers is the main source of heavy elements in the universe. Credit: T. Dietrich (Friedrich Schiller University Jena and Max Planck Institute for Gravitational Physics); BAM collaboration. The BAM collaboration is an international collaboration between the Florida Atlantic University, Friedrich Schiller University Jena, Istituto Nazionale di Fisica Nucleare, Max Planck Institute for Gravitational Physics, Università di Parma, Universidade Federal do ABC. The relative probability of different values of Hubble Constant (H0), the local expansion rate of the universe, is represented by the solid blue curve, which peaks at 70 km/s/Mpc. The dashed and dotted blue vertical lines respectively show the limits of 68.3% and 95.4% credible intervals for H0. The vertical green and orange bands represent the constraints on H0 from two state-of-the-art analyses using solely electromagnetic data: the green bands show the range of values inferred from analysis of CMBR data obtained by the Planck satellite; the orange bands show the range of values inferred from the SHoES analysis that combines Cepheid variable and type Ia supernovae data from the relatively nearby universe. The darker and lighter coloured bands indicate 68.3% and 95.4% credible intervals respectively. Note that the Planck and SHoES results are not in agreement with each other at the 95.4% probability level. 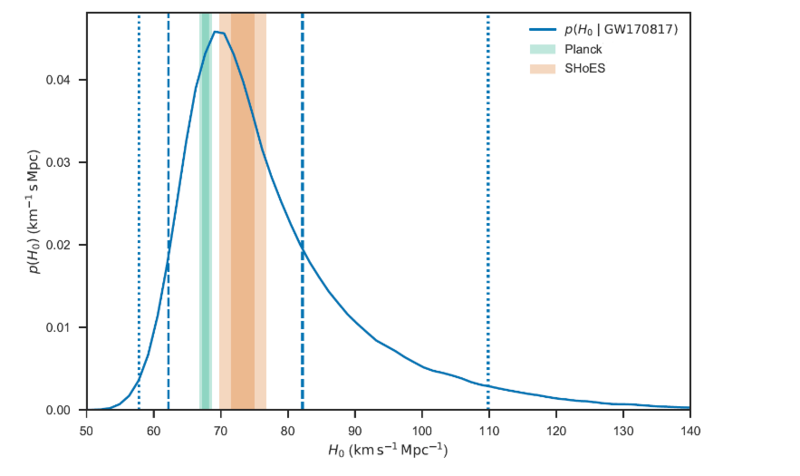 Our gravitational-wave result is, however, consistent with both the Planck and SHoES values. The small time delay between the arrival of gravitational waves and gamma rays tells us that gravitational waves travel nearly at the speed of light, the fractional difference is less than one part in 1,000,000,000,000,000. Is funded by the Department of Atomic Energy (DAE) and the Department of Science & Technology (DST), and is likely to start operating in 2024. The project is being executed by four Indian lead institutions, Inter-University for Centre for Astronomy & Astrophysics (IUCAA), Institute of Plasma Research (IPR), Raja Ramana Centre for Advanced Technology (RRCAT) and Directorate of Construction & Estate Management (DCSEM). 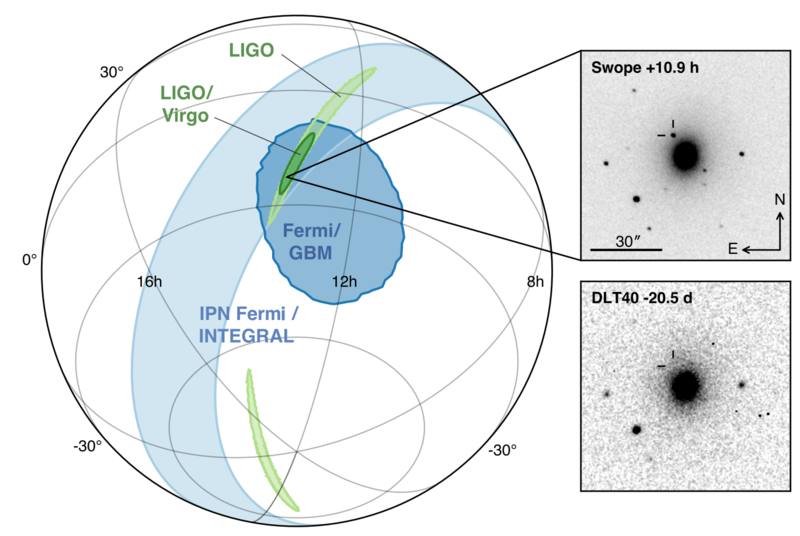 11 researchers are part of the GW170817 LIGO-Virgo discovery paper. They are Anirban Ain, Sukanta Bose, Sanjeev Dhurandhar, Bhooshan Gadre, Sharad Gaonkar, Sanjit Mitra, Nikhil Mukund, Abhishek Parida, Jayanti Prasad, Tarun Souradeep, Jishnu Suresh. IUCAA scientists were instrumental in searching for electromagnetic emission from the binary. They include Dipankar Bhattacharya, Javed Rana, Gulab Dewangan, Ajay Vibhute and Rupak Roy. The sensitive CZTI instrument on AstroSat was used to help narrow down the location of the gamma-ray flash. AstroSat was launched in 2015 by the Indian Space Research Organisation. Additionally, Rana contributed to the finding of radio emission with the Very Large Array radio observatory in New Mexico and Roy contributed to follow up with the extended-Public ESO Spectroscopic Survey for Transient Objects (ePESSTO) in Chile.